Welcome to the basics of soccer! In this guide, we’ll explain everything you need to know about The Beautiful Game. We’ll look at the basic rules, how to play, and what you need to know when you or your son/daughter begins playing the sport. In this part, we’ll look at the rules of the game set by the Fédération Internationale de Football Association (better known as FIFA) and how the sport is played. Diagram by Nuno Tavares licensed under CC-BY-SA 2.5. The sidelines on the long edge, which must measure 110–120 yards (the length of the pitch). The goal lines on the short edge, which must measure 70–80 yards (the width of the pitch). The halfway line, which runs parallel to the goal lines. 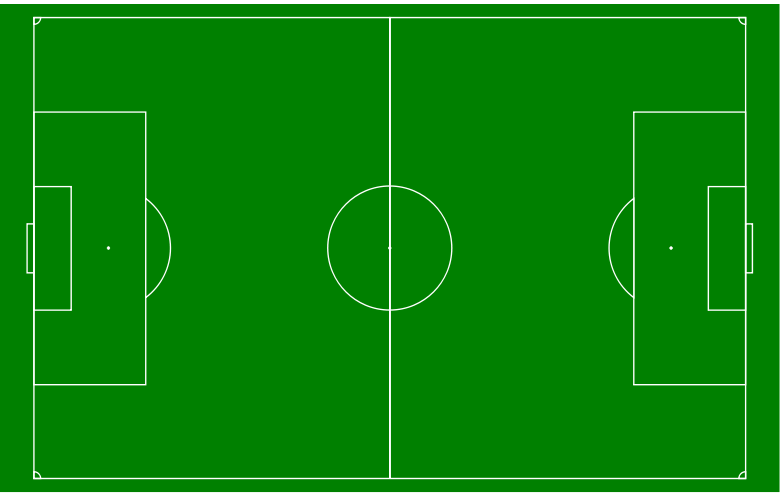 The penalty boxes (the larger rectangles) – this is the area in which the goalkeepers are allowed to handle the ball. The six-yard boxes (the smaller rectangles), in which a goal kick must be taken. The penalty spots (in the penalty boxes), from which penalties are taken. The center circle – players cannot enter this area until the ball is touched when the other team kicks off. The center spot – this is where the ball must be placed on kick-off. The corner marks (the quarter-circles) in which the ball must be placed for a corner kick. There’s also those curved lines on the edge of the penalty box. This marking (along with the penalty box lines) is the border that players cannot pass during a penalty kick (except the goalkeeper and the shooter) until the ball is struck. Two rectangular goal posts positioned on the goal line, which measure 24′ by 8′. A ball – there are a few different sizes, the most common (and largest) is size 5, which has a circumference of 27-28″. 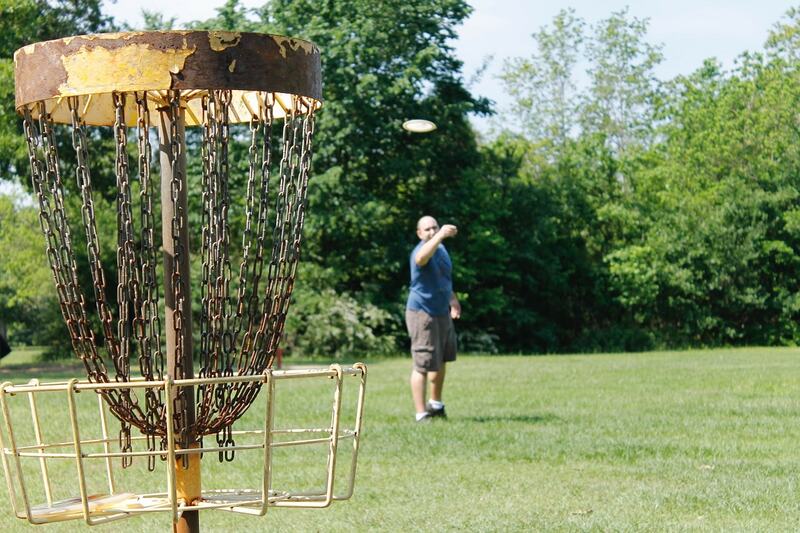 There’s other common equipment, like goal nets and corner flags. However, the laws of the game do not require them to be used. A soccer team consists of eleven players, plus substitutes. In most matches, only three substitutes are allowed. Once a player has been replaced, they cannot be substituted back on the field. Play must be stopped (when the ball goes out for instance) before a substitution can occur. Each player on a team must wear a matching kit (except the goalkeeper, who must wear a different color), shin guards, and soccer cleats. The goalkeepers are allowed to wear goalkeeper gloves. A soccer referee signaling a free kick or a throw-in. Call fouls (more on this later), throw-ins, offsides, goal kicks, corners, and handballs. Issue an official warning to a player (a yellow card). Send a player off (a red card). Two yellow cards is an automatic red card – once the player is sent off, they cannot be replaced. There is only one referee in each soccer match. However, they are assisted by two linesmen, who follow the play along the sidelines and assist in making decisions. Touching the ball with your hands or lower arms (unless you’re a goalkeeper inside your penalty box). Pushing, kicking, tripping, holding, striking, charging at, or tackling an opponent. You can try and take the ball from another player while they have it. However, you must not use excessive force in doing so and must take the ball cleanly (hitting the ball first with your foot, not the player). You may be shown a yellow card if you repeatedly break the rules of the game, dissent against the referee or perform a particularly bad challenge. Deliberately handling the ball or illegally hindering an opponent during an obvious goal-scoring opportunity (see the video below). Serious foul play or violent conduct. Spitting at, or using abusive language/gestures towards, other players or the referee. When a foul is committed, the opposition will receive a free kick. However, if the team committed the offense inside their own penalty box, a penalty will be awarded instead. This is like a free kick, but it is taken from 12 yards out and only the goalkeeper is allowed to block the incoming shot. The ball crosses the sideline: a throw-in is awarded. The ball crosses the goal line: a goal kick is awarded if the attacking team last touched the ball, and a corner kick is awarded if the defending team last touched the ball. A goal is scored: the team who conceded restarts play in the center of the pitch. A serious injury (without a foul being committed) or fan interference occurs: normally play is restarted with a drop ball, which is a neutral way of recommencing the match. The goalkeeper picks the ball up after a teammate intentionally passes the ball back to him or her with their feet. 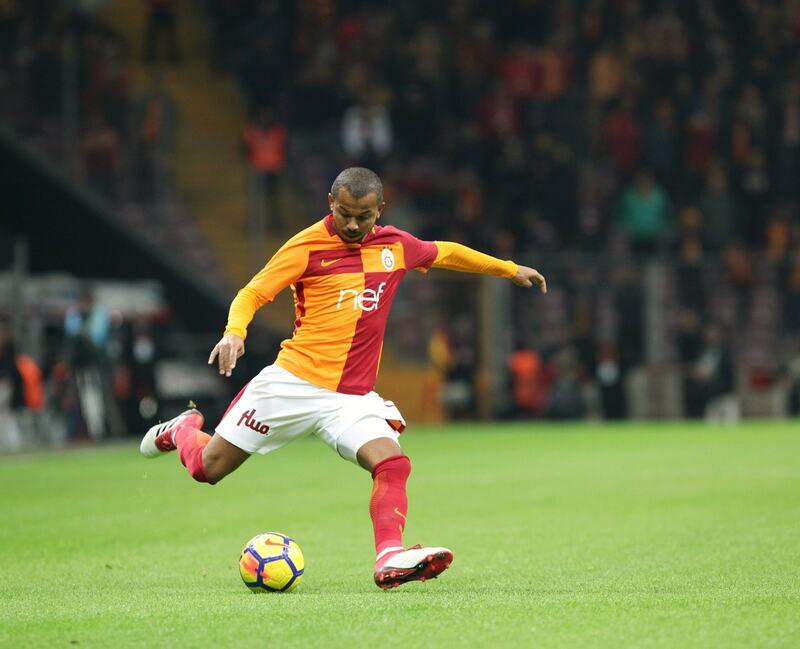 This will result in an indirect free kick for the other team, which is like a freekick but the attacking team cannot score directly off the shot (the ball has to touch two or more players before it goes in for a goal to be awarded). The half ends (each soccer game is played of two 45 minute halves, with a 15 minute break in between). A player receives an advantage from being in an offside position. Again this will result in an indirect free kick for the other team. Offside is called when a player in an offside position gains an advantage (receiving the ball or scoring a goal for example) by being in that position. Being in an offside position means that there are less than two opposition players between you and the goal you’re attacking. However, you cannot be in an offside position if you’re in your team’s half of the field. Diagram made by NielsF licensed under CC-BY-SA 3.0. In the example above, player A is in an offside position as there is only one opposition player between him and the goal line. However, play is not stopped unless P passes the ball to A, as A is not yet receiving any sort of advantage from being in this position. The laws of the game we’ve described so far apply to FIFA-sanctioned matches. However, it’s likely your league will change a few of these rules, especially if it’s a youth competition. Smaller teams, goals, and fields. No goalkeepers (for really young kids). Shorter corner kicks (not from the corner flag). Now we’ll look at some common stuff you’ll see on a soccer pitch that isn’t related to the laws of the game directly. The first thing a coach must decide when choosing his team is their formation or how they will line up on the pitch. 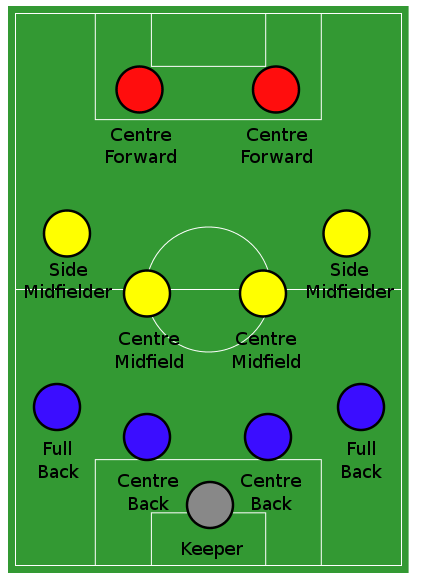 A common formation is 4-4-2 – meaning four defenders, four midfielders, and two attackers. Since you always have one goalkeeper, they aren’t included in the formation descriptor. How the 4-4-2 formation looks in-game. Original diagram by Mario Ortegon licensed under CC-BY-SA 3.0. 4-3-3: suitable for wide, attacking play. 5-4-1: a defensive playstyle suitable for counter-attacks. 3-5-2: a balanced formation that relies on the wingers to both attack and defend. 4-5-1: helps to cramp the midfield. This can then be used for short, sharp passing plays or to cross the ball into the target man (a tall striker whose specialty is heading the ball). The offside trap: moving the defensive line forward in unison to play the striker offside as the ball is kicked towards him or her. Marking players: having one player responsible for one other opposition player to keep the ball away from them, especially during corners or freekicks. Jockeying: when a defender tries to hold an attacker up (ie, not going for the ball immediately) in a one versus one situation. Typically the defender will try to encourage the attacker to run wide to avoid them shooting at their goal. Sliding tackles for the ball: a risky play (can result in a foul) normally reserved for desperate situations. The clip below demonstrates a good slide tackle. Even though the defender (in green) got the player, he got the ball first, resulting in a fair tackle. Playing with a flat back line: this makes it more likely that the opposition strikers will be offside if they are positioned behind a defender. One-two passes: a player gives the ball to a teammate and runs into space. They then immediately receive the ball again. Dribbling: when a player with the ball tries to get past defenders on their own (without passing), normally with a few sharp changes in direction. Through balls: passing the ball in front of a teammate for them to run and collect it (see the GIF below). Shots: generally, players like to shoot when they’re at the edge of the box or closer. The corners (top and bottom) are the primary targets, as this makes it less likely the goalkeeper will be able to save it. The following are some common things you’ll see when play is restarted. When a penalty is awarded, the attacking team will generally shoot. Other players will run in as soon as the player kicks the ball to collect the potential rebound. On free kicks, the player taking the kick will normally play a pass (along the ground or through the air) to their teammates. However, if they are within 30-40 yards of the goal and have a good angle, they may shoot. If they’re likely to shoot, the defending team will generally put a wall of players in the way to try and block the ball. Corners are usually crossed directly into the box to set up a header. Goalkeepers normally smash their goal kicks over the halfway line or pass to a closeby defender. Drop balls may be contested by a player from each team. However, in the interests of sportsmanship, sometimes one player kicks the ball back to the other team’s goalkeeper to restart play. 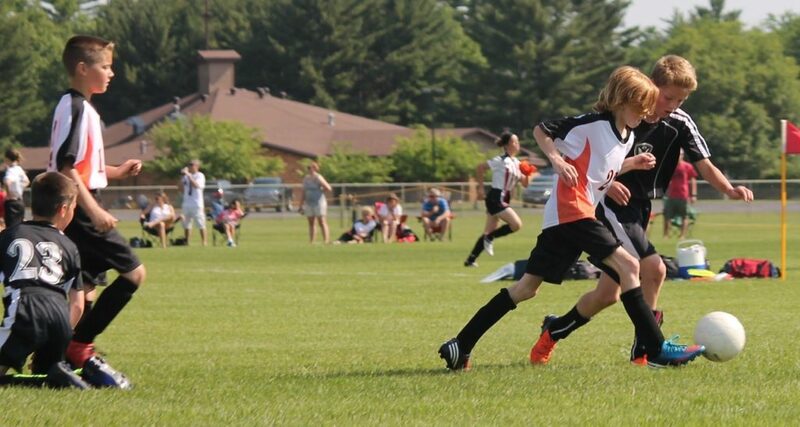 As a new soccer player (or parent of a soccer player), here are some key things to consider. This is much less important for youth players – typically the coach will rotate his squad through different roles. However, if your team has defined positions, you need to decide where to play. Do you like the idea of taking shots and heading the ball, or do you want to play passes forward into the striker? Would you prefer to be responsible for tackling opponents and intercepting passes? Or does the idea of donning the gloves and playing as a goalkeeper take your fancy? Remember you can always try a few positions out and see what you think. Shirt, socks, shorts (should be supplied or available from your club). Training gear – you probably won’t want to wear your match kit to each training session. Goalkeeper gloves (if playing in goal). A ball or two (for training and practice). Warming up is incredibly important for playing soccer, particularly for adults. Make sure your coach is introducing jogging-based warmups (not just running – include dynamic stretches like opening the gate). You should also do some static stretches (may not be necessary for kids) before introducing ball exercises like piggy in the middle. Ensure you get a good 25-30 minute warmup in before each match to reduce your chances of injury. Millions of players take the game of soccer incredibly seriously. In professional matches, it’s not uncommon to see players diving (to try and get a freekick), questioning the referee’s decisions, and time-wasting by kicking the ball away or feigning injury. However, at amateur games, such behavior would likely be frowned upon. At this level, the referee is either paid very little or volunteering their time for free, and the matches aren’t played for serious prize money. You’re there to have fun, so treat others how you would like to be treated. For parents of new soccer players, the same notion applies. 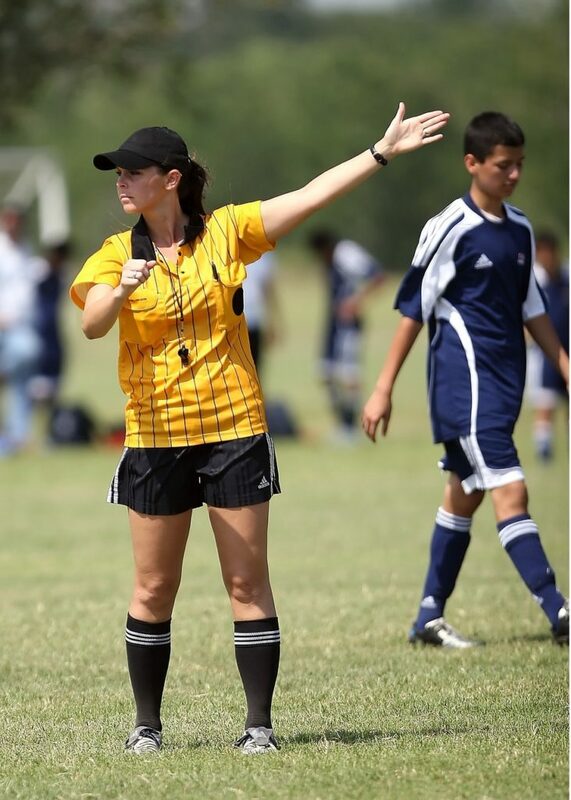 Never abuse the referee, opponents or other parents at youth league games. Do not say anything to your child that isn’t encouraging – once they get a bit older you can begin to introduce constructive criticism – but do this after matches. Your kid isn’t playing in the Premier League – hounding them over their performance will only discourage them. Unfortunately though, this does happen at times. If you see other parents shouting at their children, you’ll most likely notice that they begin to play worse. Passing: use your instep for accuracy. Dribbling: you can use your instep and the outside of your foot when running with the ball. Once you’ve got the hang of keeping it close to you at speed, practice looking up periodically instead of keeping your eyes on the ball. This is essential in helping you to spot unmarked teammates who you can pass to in-game. Shots, clearances, and long passes: impact the bottom half of the ball more towards the top of your foot (see the video below) with your ankle firmly locked in place to get it off the ground. Tackling: keep your eyes on the ball and avoid sliding unless absolutely necessary. Jockeying (defending a one-versus-one): approach the attacker almost side-on, so you can more easily turn and follow them if they sprint. Once again, keep your eyes on the ball. First touch (when you receive a pass): this one takes a lot of practice. You want to keep the ball under your control after you first touch it, so aim for a gentle touch with the instep or outside of your foot. Chest/knee control: you can also make a first touch with your chest or the top of your knee. To practice this, grab a friend and stand 30-40 yards apart. Pass the ball to each other at about chest height and try to control it as quickly as possible. Heading: always use your forehead (or the beginning of your hairline). Focus on timing your jump, and always keep your eye on the ball. When shooting with a header, try to keep the ball low. Vision: this is a slightly more advanced skill. Having good vision means you’re able to spot the available passing lanes to your teammates, and notice potential through-balls. The only way to develop this really is lots of training, particularly small sided games. The games aren’t likely to be taken very seriously. Shouting encouragement should be fine, but the matches aren’t going to be a case of life and death. You might not have referees show up to matches on occasion (if there are referees at all). In this case, a parent will have to volunteer to referee the match. You’re unlikely to see any red or yellow cards issued if the players are under the age of ten. The coach (who’s most likely a parent) will probably schedule one training session per week after school. This will generally run for an hour and involve some basic drills/games. Make sure your kid attends these sessions, and feel free to stay and watch if you want. For kids under the age of ten, serious injuries are quite uncommon. The best way to learn the ins and outs of soccer is to watch a professional match or some highlights on YouTube. Of course there are a few differences between the game you’ll be playing and what you see the pros do. However, by watching the MLS (America top flight), the Premier League (Britain’s pro league), or La Liga (Spain’s first division) you’ll be able to pick up on some good plays to make and skills to learn. Got any questions? Feel free to ask us anything in the comments below!